�Your Nutrition Solution to Acid Reflux will help you get to the cause of your heartburn, not just putting a �medication bandaid� on your symptoms. If you�re ready to make diet changes to get you heartburn free, then this is the book for you!� �Jan Patenaude, RD, CLT, director of medical nutrition, Oxford Biomedical Technologies, Inc. Tips on not only on nutritional intake but the lifestyle changes needed to find relief. Interactive tools that allow you to become a food detective and make the changes necessary to feeling better. Easy-to-follow meal plans to help get you started to life without the symptoms of acid reflux. Kimberly A. Tessmer, RDN, LD, is a published author and consulting dietitian from Brunswick, Ohio. 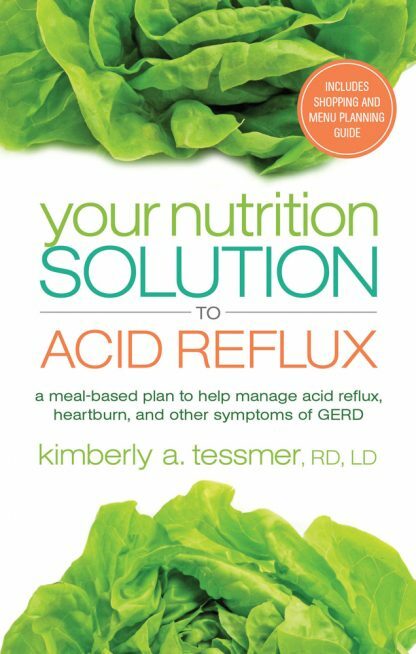 Kim�s most current books include: Tell Me What to Eat If I Have Inflammatory Bowel Disease, Tell Me What to Eat If I Am Trying to Conceive, Tell Me What to Eat If I Have Celiac Disease, Your Nutrition Solution to Acid Reflux, and Your Nutrition Solution to Type 2 Diabetes. Kim currently owns and operates Nutrition Focus, www.nutrifocus.net, a consulting company specializing in writing, weight management, menu development, and other nutritional services.